Ever since I first played the Parappa the Rapper demo on a Playstation Underground disc, I’ve loved rhythm games. 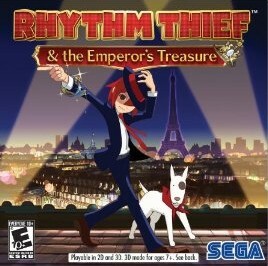 When I saw shots of Rhythm Thief & The Emperor’s Treasure last year, I couldn’t help but look forward to it. Well I finally got my hands on the game, and it has some very obvious flaws. The game certainly has some good points. The music is quite nice, and some of the games really are quite fun. The game’s animated sequences are pretty amazing. After watching them, I’m starting to think that 3D animated movies (non-CG) might work pretty well Unfortunately the game has quite a few problems, some of which I’m surprised let stay into the release. Let’s start with the core of the game: the music mini-games. The controls are quite inconsistent. Some of the mini-games use buttons, which work exactly as you’d expect. In some games (such as one in which you kick a soccer ball) using the touchscreen can really detract from the experience since it’s no where near as precise as buttons. There is just no good mechanical feedback on the touchscreen to know how close you are to touching and registering a tap. There is one dance mini-game where the controls work well, but they don’t do anything buttons couldn’t do just as well. This doesn’t have to be the case. Both Theatrhythm and Elite Beat Agents have show how well a touch screen can work for a rhythm game. Still worse the controls are inconsistent. In some mini-games tapping the screen at the wrong time counts as a miss. In every game, missing are penalized very strongly. It’s trivial to go from getting an A to a D in the game. It’s like 1 step forward 10 steps back. But in other mini-games, there is no penalty at all to using the screen at the wrong time. That means in some (such as cooking) just holding the pen on the screen and sliding it back and forth will get you an easy A. It has nothing to do with the scene in the game; but since it’s only checking that your pen is down and/or moving at the right moments it’s an easy win. This takes all the challenge out of some games. Of course there are the requisite motion controls, which are amazingly slow, insensitive, and wildly break immersion. I know the 3DS can do much better, it’s pathetic. While I enjoy the anime style visuals, the game has some graphical problems as well. There is a level where you are running across a rooftop to escape perusers, but you can’t enjoy the scene at all. Between the fast movement, low resolution, repeating texture, and occasional object flying into the screen it’s hard to get any detail out of the scenery. The outlines are the characters are generally too this, and just shimmer. The cooking mini-game suffers from this terribly. In a static scene, there shouldn’t be any problems. But the white chef robes combined with ultra-thin lines for detail on the uniforms means they look out-of-focus. I tried turning off the 3D effect to see if that made things any better, but it didn’t make a difference. It’s very distracting. Earlier I said that the animated scenes are beautiful, and they really are. Of course, they are videos, which means they are pre-rendered and the depth can not be adjusted. So when animating these scenes, they naturally chose to maximize the depth. If you don’t find having the 3D slider on all the way comfortable, too bad. 3D is poorly handled in general. During minor dialogue in the middle of some games, a static 2D drawing of a character will show on the top screen. 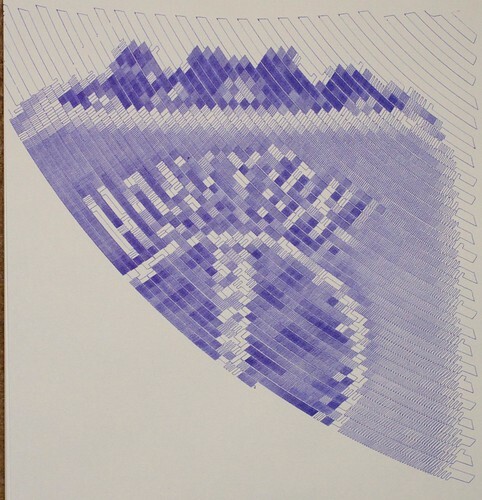 This drawing is at zero-depth (screen plane), making it easy to see in front of the rest of the action. On the other hand, the end-of-level screen is designed to look like it’s popping out of the screen. Between the small letters and the fact they are near the edges of the screen, this makes the information very difficult to focus on, breaking any immersion. But the dialog can keep you from getting immersed anyway. The game takes place in France, and takes every opportunity to make hit you over the head with generic French stuff. The main character’s dog is named Fondue. The people you talk to one the street drop little bits of French that would be in a 1st grader’s travel guide. I found this disingenuous, but the real problem is that it’s occasionally spelled wrong. “‘Toot suite”? Really? It’s tout, and there isn’t supposed to be an apostrophe in front of it. The voice acting is generally acceptable, but it’s not good. That’s just as well since the subtitles don’t always match the readings. The character will say “Baby.”, but the text will say “Childish.” That’s the entire sentence in that instance, and it was wrong. If this takes place during battle, it’s often spoken by those 2D character drawings I mentioned. They (roughly) lip-sync with the dialog, except for the few times they’re off by about 1/2 second. The animation matches the dialog well, and that’s the expensive part. But a quick scene where a character talks by cycling between mouth-open and mouth-closed frames? It can be way off. I am actually enjoying the game. When walking the streets it’s largely identical to a Layton game, and I’m eagerly awaiting the first 3DS entry. Rhythm Thief shows it could work really well. But I keep running into baffling little decisions that massively detract from the game. Just a few little bits of polish could have made such a big difference. As it is the game feels mediocre as a whole, but it could have easily been quite good. Last year I bought a copy of the book Creepy Cute Crochet by Christen Haden (NeedleNoodles on Ravelry, his site). Well in the last month or so I finally got around to crocheting again and completed my first project from the book. 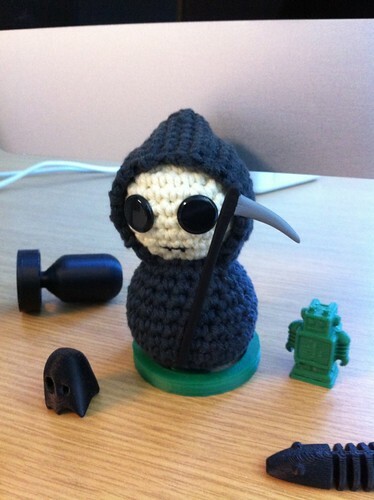 The worst part of the project was actually his scythe. I printed it out with my Makerbot as a very rough shape, and then I sanded it so it was round and the blade had a good shape. Once that was done I painted it, and that’s where things went wrong. I have liquid Testors Dullcote in a bottle, which I’ve used with my airbrush before. Well the airbrush seemed like overkill so I decided to just brush it on manually. The problem is that the dullcote leeches a purple like color out of the black paint. This means that dragging the brush from the black area to the grey of the blade caused purple streaks. When airbrushing the dullcote on there are no drip running, so I didn’t notice it. I had to re-paint the blade a few times and re-dullcote it to get it to look good. He’s very cute though. I’m working on another project right now, but I think I may make Cthulhu next. He was the reason I bought the book. What you see above is the final print from my Thing-o-Matic for a while. I finally finished off the last of the filament I own. In fact, just like when I ran out of my original natural color filament I had to switch colors mid-print (using Jetty’s excellent firmware‘s pause feature) just to avoid running out of plastic. 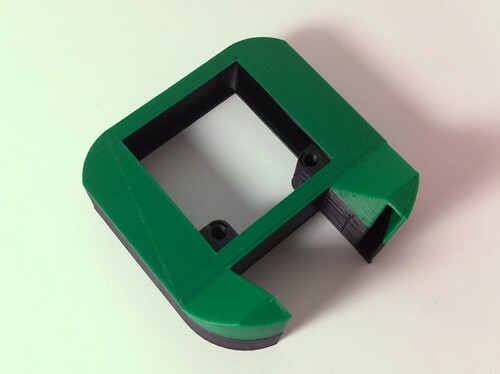 That’s a MK7 fan holder/print cooler. Right before that I printed a MK7 ball bearing extruder drive. I had wanted to upgrade to a MK7 extruder and start using 1.75mm filament, but there was no point in reconfiguring my machine while I still had 3mm plastic. I’ve ordered new plastic (white PLA and blue ABS), and it should arrive tomorrow. Unfortunately it looks like it will be at least two weeks before I’ll get my new extruder, so my Makerbot is getting a rest. For extra fun, I broke my Polargraph last week. After printing out the new case, I hooked things back up in a hurry. Well I should have thought harder about that because I got wires crossed on the pen lift servo and fried it. Dang. I got a new servo in today, so I should be back in business. I’ll have to play with it tomorrow. I think I need to adjust the position the servo uses to lift the pen up, I’m not sure it’s far enough at the default with the new servo. A new Polargraph SD case. It took a couple of tries, since the bottom part is just a little too long to fit on a Thing-o-Matic’s bed. I had to slice it into two pieces, and my first attempt caused it to be about 2mm too short. Once I received the kit, it didn’t take me too long to build. I used RJ-11 jacks and cables to connect the motors and gondola to the controller board. I started to print out the Polargraph SD’s case after it was posted to Thingiverse this morning. It’s going to take some time, the bottom of the case is just a little too big for my Thing-o-Matic, so I had to slice it into two pieces. It had been going for about 7 hours. 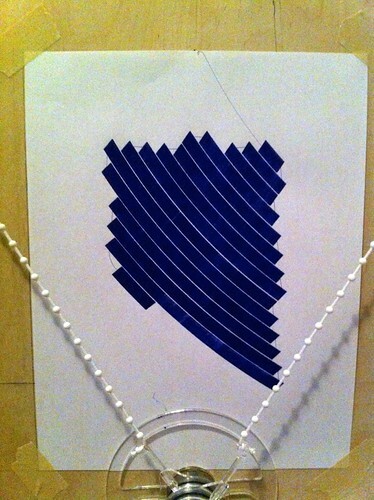 I’ve been trying the different printing styles, and this was called “solid square wave”. That seems to mean that every pixel that isn’t blank is solid black. Since it wasn’t turning out to be much of a drawing, I stopped the print. I’ve had other adventures too. We had a summer storm last week that caused two very short brownouts. They were long enough to trigger the alarm on my UPS, but not long enough to cause problems with my TV, XBox 360 or other electronics. The capacitor’s in the Arduino’s power supply kept it running, it never missed a step. On the other hand, the steppers didn’t fare as well. It looks like when the brownouts occurred, there wasn’t enough current to keep the stepper motor’s locked in position, the pen fell down the paper. That caused the neat little mistake above. 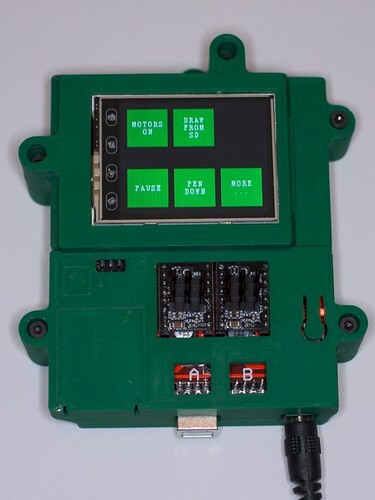 I’m using a giant linear wall-wart for a power supply, and I guess it doesn’t have enough output filtering to be able to supply the motors during those fractions of a second. I’ve had a few other adventures. At one point I accidentally changed the pen width to be much too wide. This caused drawings to look too sparse (first attempt), instead of having the contrast it should. I also had a positioning problem caused by running firmware that was too bleeding-edge out of the SVN tree. It meant I got to help debug the problem, which Sandy quickly fixed. When I tried the Norwegian drawing style, I ran into an issue with the way The Gimp made the headers on PGM files, which I fixed myself. That meant I wrote and submitted my first patch to an open source project. A couple of years ago I saw a link to a robot called Hektor. The robot draws with a spray paint can, moved around by two stepper motors which dangle the can from a gondola. I thought it was great, but I never thought I’d have something like that. 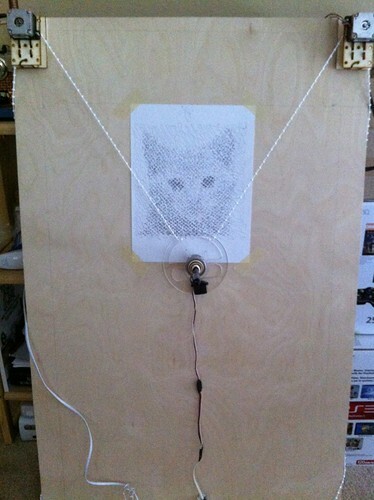 In the last two years, I have learned about Arduino based drawing robots such as the Drawbot and the Polargraph. I got even more interested earlier this year following MakerBlock’s Drawbot adventures. I was busier at the time tinkering with my Makerbot, but I was also worried about another aspect: I didn’t want to have to leave my laptop connected to the machine for hours. One of my favorite features of my Thing-o-Matic is that I can operate it from the LCD interface and print from an SD card, so my laptop remains available. 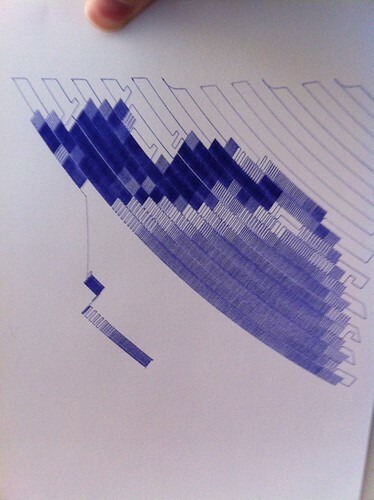 Sandy Noble showed pictures in April of a prototype of the Polargraph SD. I watched that but when it was released I decided not to do anything because at £255 (after shipping) it was just too expensive. Earlier this month I got the itch again, and I was going to send an email asking if there would be a cheaper kit version when I noticed the vitamin kit. I can’t help but wonder if it was available the whole time and I just missed it every time I checked. But it was there, and I had the time, so I bought one and started using it. How Does Accelerated Printing Look? Since I recently got accelerated printing working using Jetty’s firmware, I thought I would try to see what kind of quality difference I would get. The cute little octopus was designed by Makerbot, and I knew I had to print him. The copy on the left was printed without acceleration, using the standard 30 mm/s feedrate. 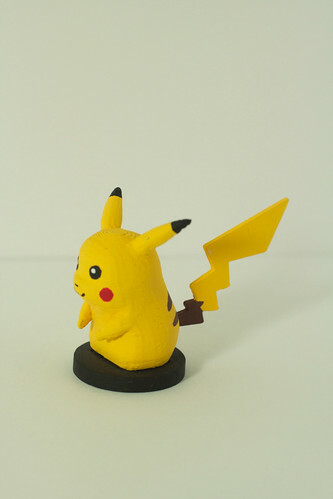 He took about 45 minutes to print (he’s about 1.5″ tall). 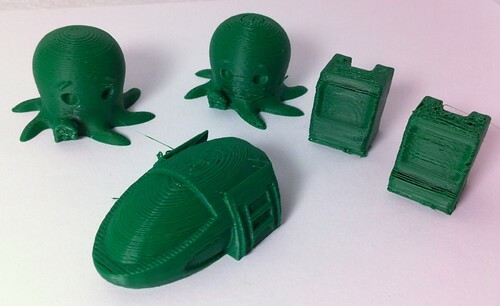 The octopus on the right was printed accelerated at 75 mm/s, and took about 20 minutes. He actually came out pretty well. Some of the layers are slightly misaligned, but I know that my settings need more tweaking. The hovercar in front was actually my first really successful accelerated print. He was printed a few weeks ago, also at 75 mm/s. The two Mac Plus models are a different story. They were the first objects I tried to at high speed after getting the calibration cubes to work well. I believe the one on the right was printed first, but it was printed at 100 mm/s. The one of the left was printed at 75 mm/s and did better, but I think the model was just too small to be printed at such high speed. Since I was only using 15% infill, the layers took so little time I don’t think they were cooling enough before the next layer started, causing the poor finish. I’ve been playing with accelerated printing on and off, I still need to do some tweaking. Stuff I want to come out well (such as my Raspberry Pi case, and a case I’m printing for my Polargraph SD) I still print unaccelerated. 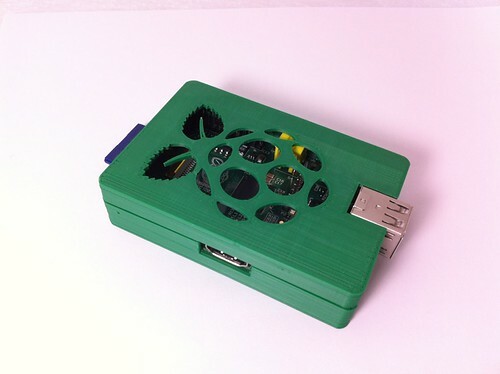 Earlier this year when my number came up in the queue, I put in my order for a Raspberry Pi. It arrived in the last week or so, and I printed out HansH’s case to give it some protection and style. The print took surprisingly little time even though it wasn’t accelerated. The only problem is I haven’t figured out what to do with it yet. I use Rogue Ameoba’s Radioshift (which apparently is no longer developed) to record two radio shows, but they don’t show up as podcasts in iTunes. I’ve been thinking of using the Pi to server up those files to iTunes so they would show up correctly. Last week I cleaned my desk at work. 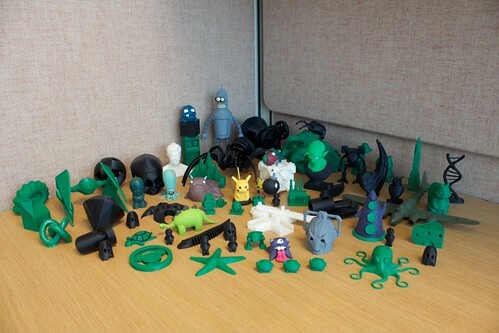 While I was moving stuff around, I figured it would be a great chance to take a family photo of the various Makerbot’ed goodies hanging around in my cube. The first model I painted was my B-17 Flying Fortress. In that post I said I tried a cheap airbrush with a propellant can and it didn’t work. That model was largely hand painted. But I haven’t stopped experimenting. For Christmas I got an Airbrush Depot TC-20T compress and SB84 airbrush. The compress is very nice. It’s not all that loud and having the tank means that it doesn’t have to run constantly. I’m always worried about annoying my downstairs neighbors, so that’s a serious plus. As for the airbrush, I though it was pretty good. While it was a huge step up from the external mix piece of plastic junk I tried before, it was tough to clean. It also needed quite a bit of air to spray paint. I generally used the brush with the nozzle open all the way to get enough paint. This may be because it’s a side-loading airbrush. A month or two ago I was reassembling it after cleaning, and broke the nozzle when I overtightened it. I was going to buy a new one when I found that an Iwata wouldn’t cost too much more (I thought they were all $250+). So I bought an Iwata-Medea Eclipse HP CS. As soon as I tried the Eclipse I knew what a huge difference there was. I knew people online liked them, but wow. It’s top-loading, and that makes it MUCH easier to clean. Pulling the lever back all the way to release the maximum amount of paint just drenches things, which is fantastic. The SB might as well have been an on-off device. A side effect of all this is that it doesn’t need as much air. When you have it in your hand, it’s easy to tell how much higher the manufacturing standards are. Add a quick disconnect and life is much easier. So with my new tools I’ve been having a ton of fun painting models that I printed out with my Makerbot. Besides the Pikachu above, I’ve painted Alot, Piccolo, a Stegosaurus, a Cyberman, Bender, Purple Tentacle, and various pet monsters by Andreas. I’ve figured out quite a bit while doing it. Preparing the model well before putting the primer on makes a big difference. It’s so easy for the paint to flake off afterwards, something you can see on Bender. Another problem I’ve had is paint colors. I’ve been using Createx opaque paint and mixing the colors myself. This has been fun but I quickly learned a lesson: mix more than you need and save it. With Bender and each of the pet monsters, I ended up having to repaint large portions of the model because I needed to put the base color back on and couldn’t match it closely enough. I’ve found that Testor’s gray primer works great, and you can buy straight liquid so you can airbrush it on. For sealing the finished models I tried a few things before I found Testor’s Dullcote. It smells horrible, and I worry that I’m going to damage my airbrush with it. Next time, I think I’ll just buy the little spray cans instead. But unlike some of the other clear coats I found, it doesn’t change the colors making everything look less saturated and more boring. I didn’t really have a use for my Makerbot when I bought it, but I think I may have found it. Since I’m close to getting to getting Jetty’s accelerated firmware fully calibrated, I’m looking forward to printing larger objects without it taking as long. My mistake the first few times? When you up the speed, you must up the flow rate. I kept forgetting to do that, which is why the extruder wasn’t putting out nearly enough plastic.